Did you know that Bananas contain tryptophan and vitamin B6, which make you feel happy? Hmm neither did I. I didn't know that we spend £10 billion a year on this funny fruit making it the most popular fruit in the world. It makes sense why the Fairtrade Foundation campaign strongly for banana worker rights. Most banana plantation workers barely earn enough to support their families with some earning less than £1 per day. Banana diseases are also a big problem for growers in poorer countries. There are things we can do to help the foundations cause. 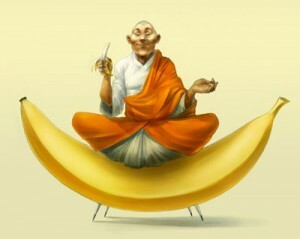 Only buy Fairtrade bananas is the obvious one. And a good opportunity to help spread the word is to be a part of the world's biggest Fairtrade banana-eating record attempt by eating a Fairtrade banana anytime between noon on Friday 6 March and noon on Saturday 7 March. 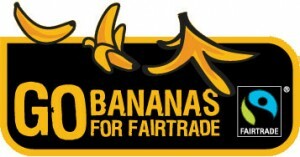 Visit the website for information on which suppliers stock Fairtrade bananas and download a scrumptious banana recipe. Also, if you have one, there is a online photo album where you (or the kids) can download your favourite banana-inspired picture. So banana rama to it in Fairtrade style or, in the case of these rapping Bananas, banana cool style!